AMES, IOWA -- Ohio Governor John Kasich ratcheted up his criticism of Republican frontrunner Donald Trump Monday, part of a continuing effort that appears to have no end in sight. “I’m having a little problem with one of the candidates for president,” Kasich told a room of over 100 potential caucus-goers at Iowa State University Monday afternoon. Kasich’s campaign has released two web videos in the past seven days forcefully attacking Trump by invoking the Holocaust and questioning the real estate mogul’s worthiness of the presidency, adding to a number of Youtube posts singling out the current poll leader for the GOP nomination. But Kasich insisted that the ads are not personal. “I mean, this is not designed to really be any personal attack on him, that’s not what it is … it’s a call to unify, not to divide,” Kasich told reporters when asked about the recent digital spots. In a web video released Monday by the Kasich campaign titled “Is He Worthy?” Trump is featured by various news agencies appearing to imitate a New York Times reporter’s disability during a rally in Sarasota, Florida last Tuesday. Leading into the Thanksgiving holiday, Kasich’s campaign released another web video directly attacking Trump using Colonel Tom Moe, a POW and U.S. Air Force Veteran from the Vietnam War. In the video Col. Moe compares Trump’s rhetoric regarding Muslims, Hispanics, protesters and journalists to the now famous Holocaust poem, “First they came for the socialists,” by German Pastor Martin Niemoller, inferring that Trump alienates specific demographics of people. The video has over 300,000 views and gained significant media attention last week. “The issue of attacking Hispanics or Muslims or women, or mocking somebody who’s disabled, it’s just not what we want in a leader,” Kasich explained during his one day trip to Iowa. “There are a lot of people that are glad that I’m finally speaking out, cause no one else is,” the candidate added. A campaign aide quickly noted that the ads do not cost any money, and that they are all made “in house.” The aide told reporters that the goal was “earned media” from the web videos and were geared toward going viral on the internet rather than airing on television. Reacting to an increase in such punches thrown by Governor Kasich, Trump responded earlier in November by blasting the candidate repeatedly on Twitter. Doesn’t help Kasich to do negative ads on me because he still has to go through everyone else - he’s almost last. In Iowa, Kasich is polling at the bottom of the pack with an average of 1.3 percent support according to Real Clear Politics, while Trump remains on top with an average of 26.7 percent. Kasich is faring better in New Hampshire, where he hopes to perform well, with an average of 7.8 percent according to Real Clear Politics. Trump still dominates the field in the Granite State with support in the high twenties. Despite the current standings, Kasich doubled down on Trump saying that “he’s not going to be the nominee” insisting that he “won’t last” and that polls don’t tell the full story. Earlier in the day, Senator Ted Cruz held his own event in the Eastern part of the state, where he also dismissed the idea of Trump winning the GOP primary. “Let me be very clear: I don’t believe Donald Trump is going to be the nominee. I don’t believe he’s going to be our president,” said Cruz. Cruz then emphasized Iowa’s importance in ensuring that Trump did not get that far, whereas Kasich telegraphed a different message. A man in a bowtie and light blazer at Kasich's Iowa State event Monday made the candidate light up when he said he’d driven six hours through the cold rain and sleet from St. Louis to see the governor in Ames. 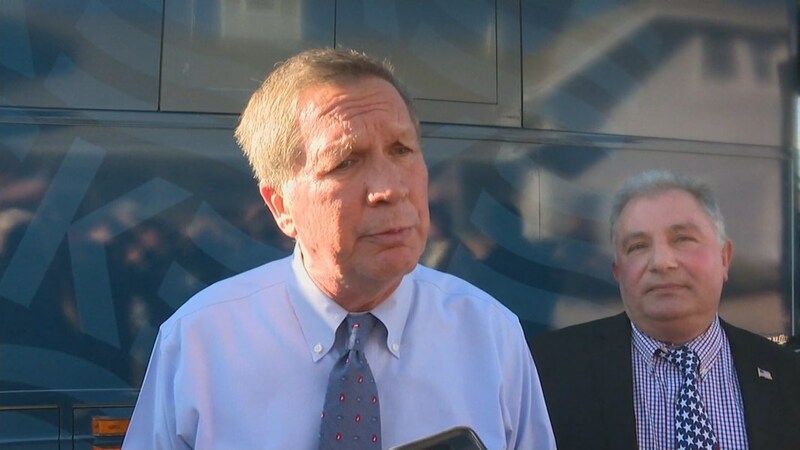 “He drove here from St. Louis!” exclaimed Kasich to the press with a big smile.